Milan fans everywhere seem to be not only deflated, but writing off this season like the past three. However an unpopular opinion is that there has actually been quite a bit of progress and growth this season. As that is my unpopular opinion, for this conversation, we explore whether or not that is true and why and how. 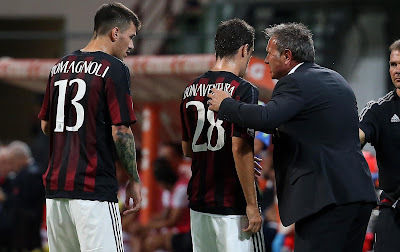 So listen and feel free to let me know if you agree that this year could finally be year zero in a Milan comeback. It is with a very heavy heart that I admit that this podcast, my 1200th post, is my last post on this blog. After all of these years with Berlusconi & Galliani’s epic fails, now I have had to put up with “Milan fans” who are a disgrace to the word fan, let alone the legends who made this club great. Plus, the team never comes to the West Coast anymore, finally they’re coming to San Franscisco, and I don’t even get to go. I have tried so hard to keep telling myself that I am here for the crest, but frankly, it is just too tarnished for me to obsess over anymore. I have not made it a secret how much I admire Sassuolo. Their management has just done wonders since promoting to Serie A, and Di Francesco is a great coach, too. Even their website is better than Milan’s. And Acerbi has lived more lives than even Mexes. Plus, they killed Allegri’s term at Milan, so I am forever in their debt. So I will now be supporting the Neroverdi. I haven’t yet decided whether or not I will be blogging about them, but I will certainly not be blogging about Milan here. While it has been a very rough ride with all of the sexist fans, the abuse, the sexist commenters, the stalkers, the sexist idiots, the rapists, the sexist Milan fans, the wannabe journalists, and all of the fans, commenters, and others who were idiots but not necessarily sexists, I will also not miss those who pledged support and comments when I was injured or otherwise in need and failed to show up. Again and again and again. However, I will miss a lot of you and having the chance to interact with you here and on Twitter. Lastly, since my new club are also vying for a Europa League spot, I’ll see all of you in hell!! As many of you guessed, this began as an April Fool's Joke, the key being that I would never support Sassuolo... that shade of green alone is dreadful. But the joke was on me, as everything else was true and caused me to question not only my sanity but the ridiculous amount of time I spend and the insane amount of adversity I face for all I do here. 1200 posts written so consistently over five years time without any compensation is almost unheard of. And yet the adversity I have faced while doing so is absolutely deplorable. Why I have continued this long under such circumstances again brings into question my sanity. Please bear with me while I sort things out and perhaps get a psychological evaluation. Forza Milan.